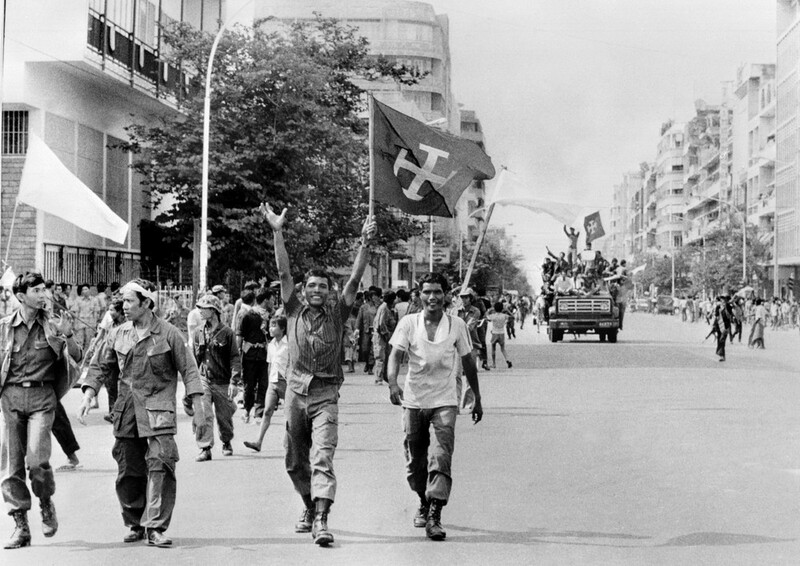 Khmer Rouge: Members of the MONATIO (Mouvement National) group wave flags 17 April 1975 as they enter Phnom Penh, the day Cambodia fell under the control of the Communist Khmer Rouge forces. The Cambodian capital surrendered after a three and a half-month siege of Pol Pot forces. The Mouvement National (MONATIO) was a small political faction which welcomed the Khmer Rouge upon their arrival in Phnom Penh and were later quickly eliminated. 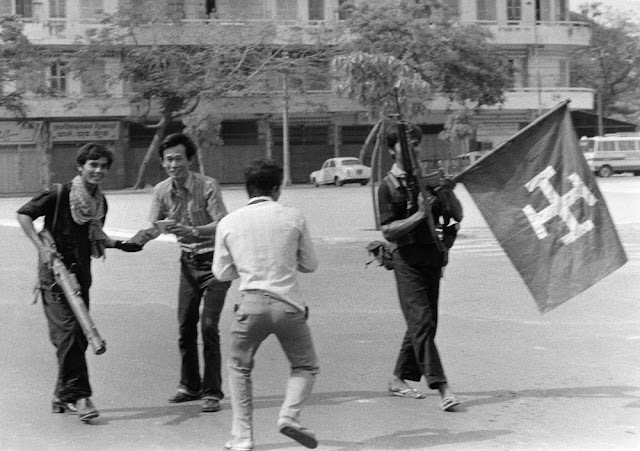 Khmer Rouge: Members of the MONATIO (Mouvement National) group brandishing their flag are greeted are greeted by jubilant youngsters as they walk the streets in Phnom Penh 17 April 1975. On New Year's Day 1975, Communist troops led by Pol Pot and Ieng Sary, launched an offensive to oust Lon Nol's Khmer Republic. The Lon Nol governement in Phom Penh surrendered 17 April 1975 after 117 days of the hardest fighting of the war. Immediately after its victory, the PCK ordered the evacuation of all cities and towns. Many of the foreigners and some Cambodians, who couldn't or wouldn't flee Cambodia, took refuge at the embassy from which they were taken by truck to Thailand two weeks later. 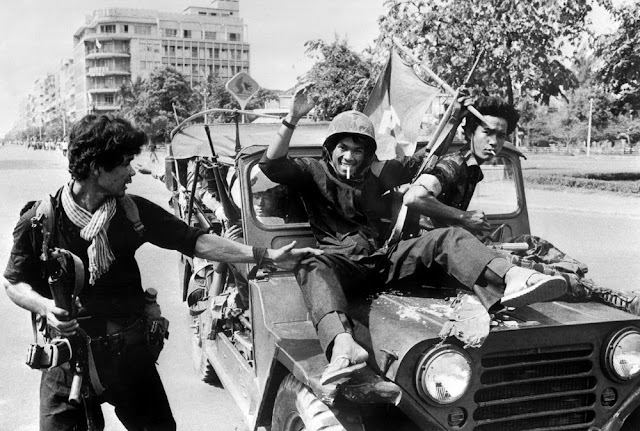 The Mouvement National (MONATION) was a small political faction which welcomed the Khmer Rouge upon their arrival in Phnom Penh and were later quickly eliminated. Khmer Rouge: File photo dated 17 April 1998 shows photographs of the victims of the 'Killing Fields' displayed at the genocide museum in Toul Sleng prison (S21), a former school, turned into a torture camp by the Khmer Rouge where more than 16,000 people were imprisoned here between 1975 and 1979, only seven are known to have survived. The Cambodian government will press ahead with efforts to try surviving leaders of the Khmer Rouge despite a UN decision to withdraw from an international tribunal, a government spokesman said 09 February 2002. 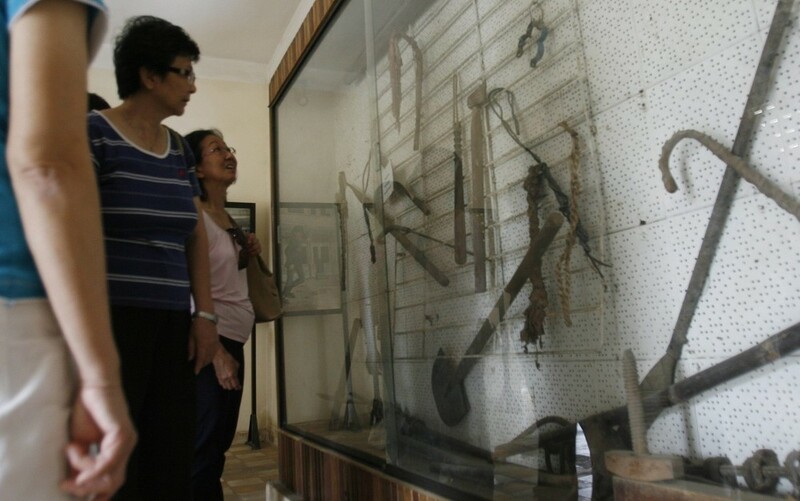 Khmer Rouge: Foreign tourists look at a photograph of Khmer Rouge victims on display at Tuol Sleng Genocide Museum (S-21 prison), in Phnom Penh, Cambodia, 11 January 2012. The top former Khmer Rouge leaders give the public testimonies before Cambodia's UN-backed war crimes tribunal in a substantive hearing in Case 002. 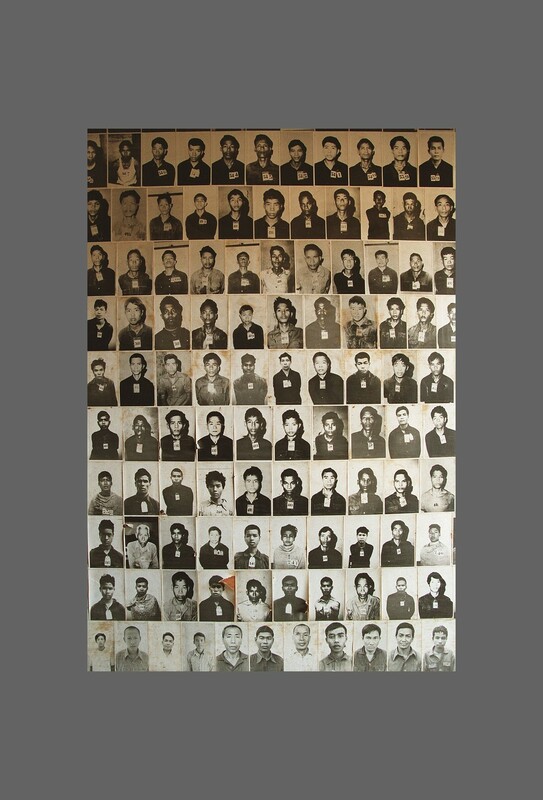 The accused in Case 002 are former Khmer Rouge Deputy Secretary of the Communist Party of Kampuchea Nuon Chea, former Khmer Rouge Head of State Khieu Samphan, and former Khmer Rouge Deputy Prime Minister in Charge of Foreign Affairs Ieng Sary. Khmer Rouge: Foreign tourists look at torture tools on display at Tuol Sleng Genocide Museum (S-21 prison), in Phnom Penh, Cambodia, 11 January 2012. The top former Khmer Rouge leaders give the public testimonies before Cambodia's UN-backed war crimes tribunal in a substantive hearing in Case 002. 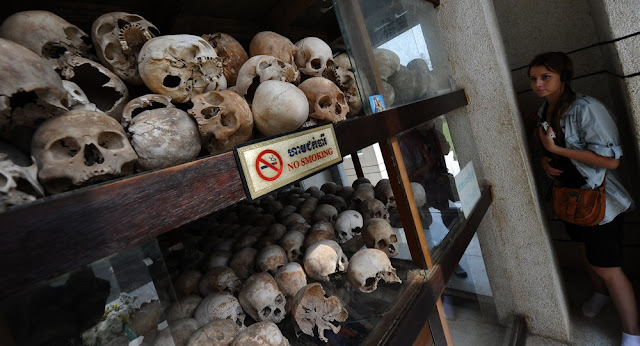 The accused in Case 002 are former Khmer Rouge Deputy Secretary of the Communist Party of Kampuchea Nuon Chea, former Khmer Rouge Head of State Khieu Samphan, and former Khmer Rouge Deputy Prime Minister in Charge of Foreign Affairs Ieng Sary. A foreign tourist looks at skulls of Khmer Rouge's victims displayed in a stupa at the site of the former killing field at Choeung Ek in the outskirts of Phnom Penh on February 2, 2012. 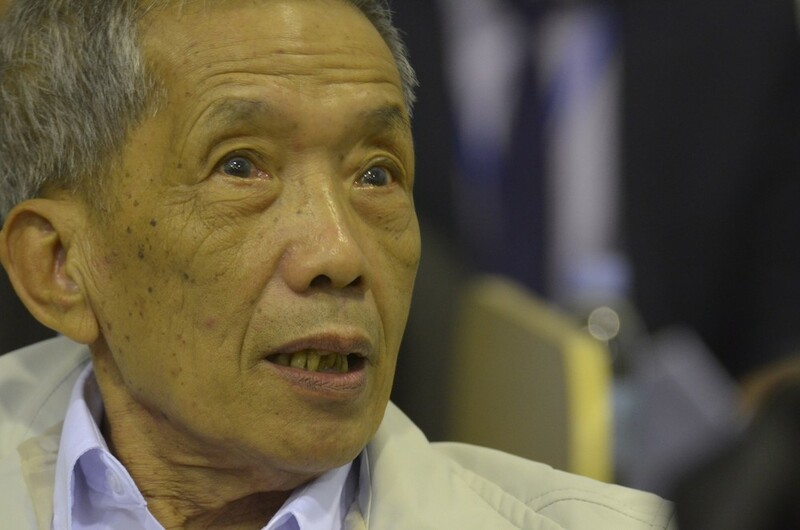 A Khmer Rouge jailer who oversaw the deaths of 15,000 people at a notorious torture prison will learn his fate on February 3 when Cambodia's UN-backed court issues its final judgment in the landmark case. 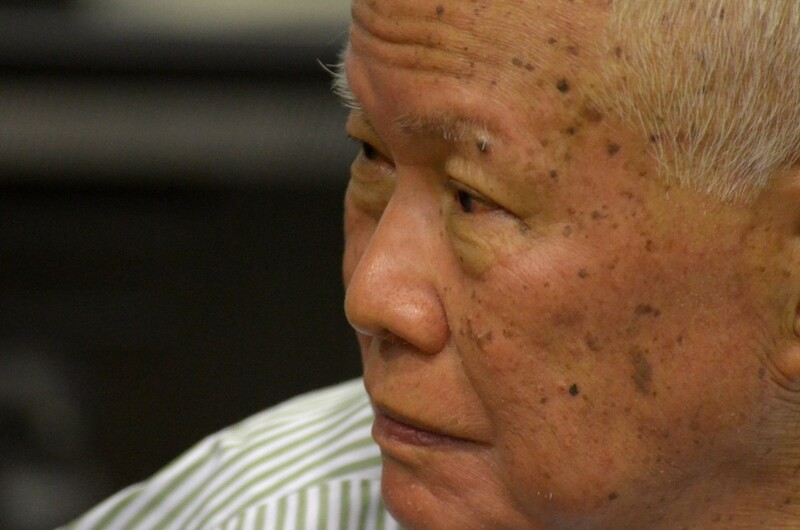 An Extraordinary Chambers in the Courts of Cambodia (ECCC), handout photograph shows former Khmer Rouge Deputy Prime Minister in Charge of Foreign Affairs Ieng Sary, in the courtroom during a public hearing at the ECCC, in Phnom Penh, Cambodia, 10 January 2012. The top former Khmer Rouge leaders give the public testimonies before Cambodia's UN-backed war crimes tribunal in a substantive hearing in Case 002. 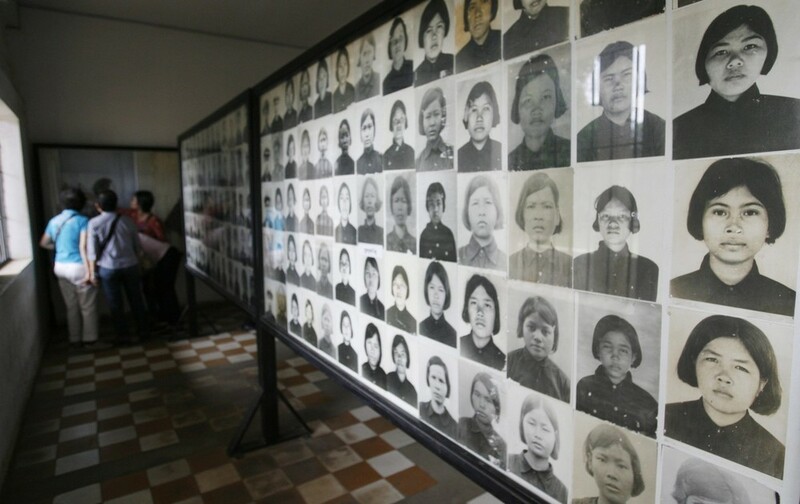 The accused in Case 002 are former Khmer Rouge Deputy Secretary of the Communist Party of Kampuchea Nuon Chea, former Khmer Rouge Head of State Khieu Samphan, and former Khmer Rouge Deputy Prime Minister in Charge of Foreign Affairs Ieng Sary. Former Khmer Rouge S-21 prison chief Kaing Guek Eav alias Duch attends his appeal hearing at the Court Room of the Extraordinary Chambers in the Courts of Cambodia (ECCC) on the outskirts of Phnom Penh February 3, 2012. The United Nations backed tribunal on Friday rejected Duch's appeal and increased his sentence to life imprisonment, according to international media. 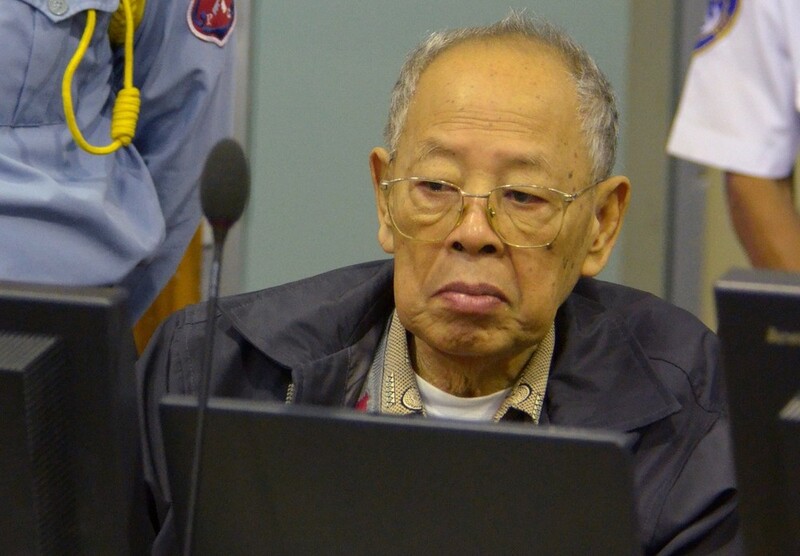 An Extraordinary Chambers in the Courts of Cambodia (ECCC), handout photograph shows former Khmer Rouge Head of State Khieu Samphan, in the courtroom during a public hearing at the ECCC, in Phnom Penh, Cambodia, 10 January 2012. The top former Khmer Rouge leaders give the public testimonies before Cambodia's UN-backed war crimes tribunal in a substantive hearing in Case 002. 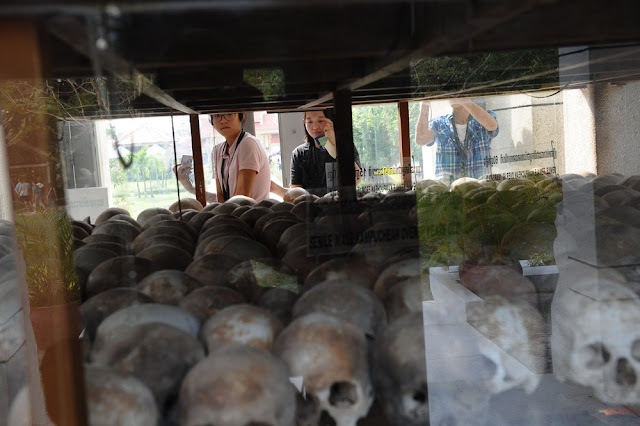 The accused in Case 002 are former Khmer Rouge Deputy Secretary of the Communist Party of Kampuchea Nuon Chea, former Khmer Rouge Head of State Khieu Samphan, and former Khmer Rouge Deputy Prime Minister in Charge of Foreign Affairs Ieng Sary.